A former fashion photographer now doing documentary work, Izabella Demavlys writes in her artist's statement that "to illustrate a deeper definition of female beauty, I photograph women whose pictorial beauty radiates from their accomplishment, character and personal struggles." 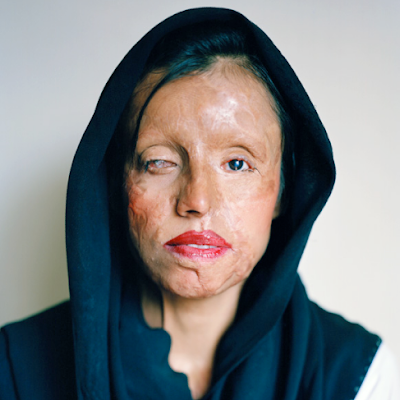 Her latest series, "Without a Face," offers a direct and profoundly affecting kind of beauty: portraits of Pakistani women healing after attacks by men wielding kerosene oil or battery acid. One, 20-year-old Memona, was attacked by a boy on her way to school; she's undergone some 30 reconstructive surgeries. 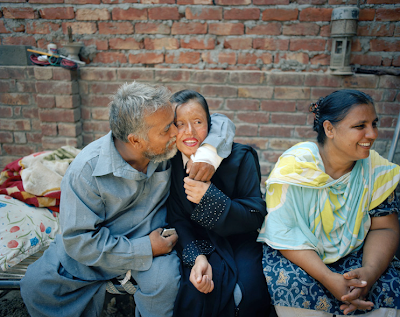 Saira (below) was burned by her husband for refusing to move in with him. According to Demavlys, 400 women in Lahore alone are currently awaiting surgery from such attacks. 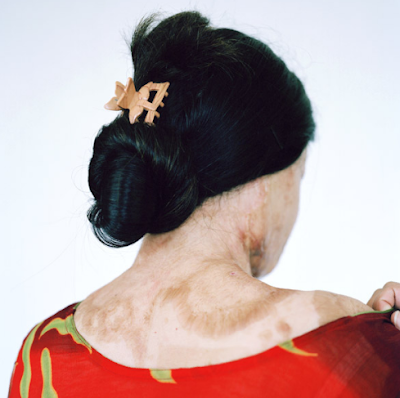 In an email interview, Demavlys told about her move from fashion photography -- which she says presents a distorted image of beauty -- to these portraits of women who, while disfigured by acts of hatred, force us to reconsider ideas about beauty and resilience. In discussing what she feels her earlier work lacked, she used a fitting term, one used by Roland Barthes: The images in "Without a Face" undeniably have "punctum," the ability to "wound" or "pierce" the viewer. Paul Schmelzer: In thinking about blogging this, I confess having some hesitation: I didn't want to use an image of pain and disfigurement to stand for an entire multidimensional person. Can you talk about the rhetoric of the "Without a Face" series? Did you fear you'd reduce a woman like Saira to just the story of her attack and suffering? Or, perhaps, is that what's happened to women like her -- disfigured this way, they're reduced to this one moment in their history every time someone sees their scarred faces? Izabella Demavlys: I was going around in circles for many years making meaningless work. Meaningless and uninspiring for others and myself. When I saw a story about a young girl, an acid burn victim working as a beautician in Pakistan last year, I immediately thought, "This is a person I need to meet." I thought this woman stood for everything I wanted to express with my work. I never went to Pakistan with a fear that I would reduce them by photographing them, but rather feared that I wouldn’t be able to enhance them enough, showing what a source of inspiration they really are to me and to be able to convey that to others. To not show these photographs to the world would be to deprive them of their courage for sitting down for a portrait and later telling me their stories. What a paradox, what is going through someone’s mind getting her makeup done when the beautician’s face is so severely burned? Does it make you more thankful, does it make feel more empathy? What does it tell you about beauty? Can this woman change someone's perspective about beauty? All the dimensions of a person cannot be viewed in one single photograph. 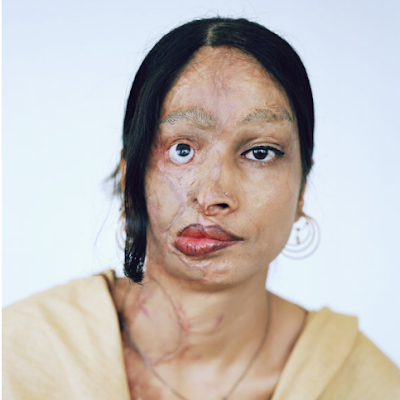 But the pain and disfigurement these women have survived is a large part of their identity. One in which I would like to expose to others. Their pain is a reminder to all of us how small our problems often are. PS: In Regarding the Pain of Others, Susan Sontag wrote, "Harrowing photographs do not inevitably lose their power to shock. But they are not much help if the task is to understand. Narratives can make us understand. Photographs do something else: they haunt us." The shocking nature of "Without a Face" is contrasted by the softer-edged "Saira" series, where you capture one of these women in the context of her home and family, who were welcoming to you. Is this series your "narrative"? Comment on Sontag's notion (which was specifically about war photography)? ID: I don’t think we can ever fully understand what is going on if we’re not in the same situation ourselves. But we can feel empathy. In anger, rage, compassion, etc., and become more aware of these issues through the solidarity of human emotion. We can come to a point that we want to help by looking at harrowing photographs. I can’t comprehend waking up every day without having a nose or being blinded because someone decided to throw acid on my face. The images I make may haunt you deeply, but they will never make you fully understand. ID: Many people have emailed me and asked for more information about acid burn victims and how they could help. There’s always something we can do. We have to stop thinking we cannot play a part. I want to disturb people's oblivion; like I’ve pointed out before, I want to make people feel something. It’s easier to turn to the sport channels when news about the war comes up. It’s easy to talk about how depressed we are as a rich nation, and we do this even though 1.4 billion people live at the poverty line or below. Many of us in the West live in a bubble, but I still believe we can shake people up from their daily routines. It all comes down to educating myself as well as others, and appreciate what we already have because so many people have to deal with such greater hardships. PS: How do you see the "Without a Face" work relating to your other projects (say, your NYC portraits)? My NYC portrait section is lingering from the past. I’m moving away from that type of imagery and I hope in the future to work more on projects like "Without a Face." Projects that touch sensitive and important subject matter. Even so, I am very inspired by artists such as Alec Soth and Richard Renaldi. The aesthetics of the large-format camera, the interest in portraiture, and the focus on women will always be present in my work. PS: So much of mainstream photography idealizes the female figure and face. While those photos allow us to gaze on "beauty," yours allow us to linger on images we don't often see in person -- and, if we did, ones we'd likely be shy to examine closely in person. How do you see this project as responding to or reacting to beauty-focused photography? Are you, in some way, monumentalizing women who don't fit the mainstream (western) beauty paradigm? Is there a link between fashion (your past field) -- which seems in large part based on male preferences for the way women "should" look -- and these crimes against women which are perpetrated by men? One of the reasons I shifted over from fashion photography was its conceptualized views of women. I came to a point where I couldn’t work in that environment anymore. My past in the fashion world wasn’t giving my viewers any images that had punctum (Roland Barthes), nor did my work change perceptions, behaviors, or engage the viewer in any issues. I simply fueled the fashion world with more images of young women who would represent what I believe is a distorted idea of beauty. I had an urge to show my definition of beauty. Beauty to me does not sit on the surface, it’s radiates through how you make an example of yourself to others. How you directly or indirectly inspire others through your personal struggles and through your accomplishments in life. Thank you so very, very much for this important, incredible post. I've quoted you in my own -I hope you don't mind! Thanks again -keep up the great work. Thanks for this interview Paul and for introducing me to this artist. I agree with Catherine; this is an important, incredible post. Another photographer that is doing incredible portraits and work empowering women...Phil Borges, check out his book, "Women Empowered,Inspiring Change in the Emerging World." I agree with Izabella when she says that a woman's beauty "radiates from their accomplishment, character and personal struggles." Looks are so short-lived. I am a fan! i am sick of the conventional concept of beauty, the oblivion people live in is appalling. These women are strong and beautiful but these photographs shake you to think, yes helping is good but people don't think..THNK! I am an a photographer and pakistani.